How water flows across a region’s surface affects many aspects of the landscape. A watershed is the area of land that drains into a body of water. The largest watershed in Northeast Ohio is Lake Erie. 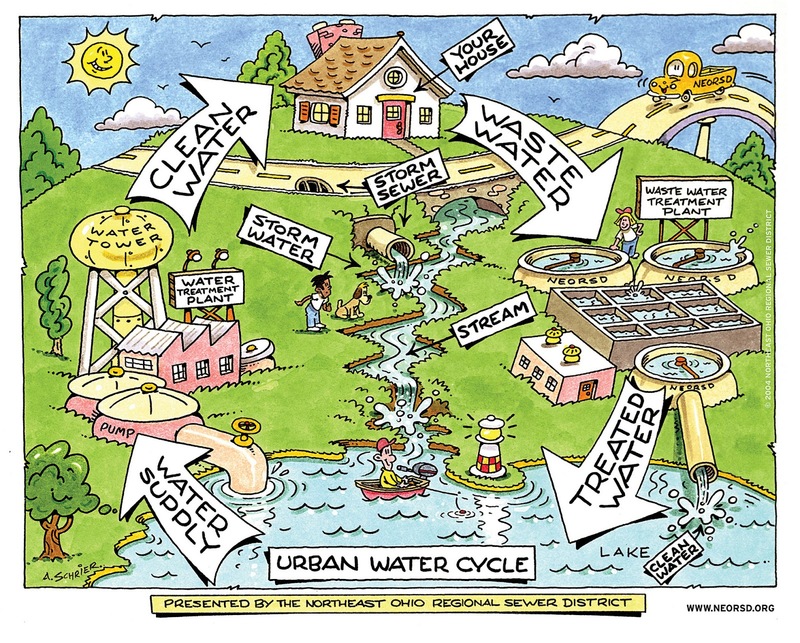 Below is a simple illustration of a typical watershed. 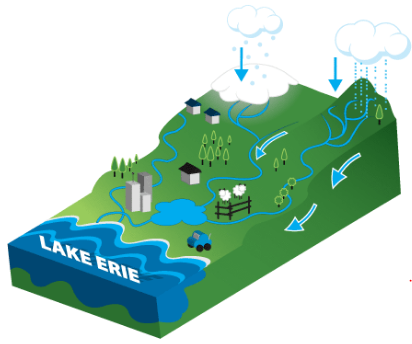 Protecting the Lake Erie watershed and the more than two dozen smaller watersheds that drain into the lake is important to the environment, public health, and the economic well-being of Greater Cleveland. When stormwater runoff is not managed properly, the result is flooded streets and properties, land erosion, and overrun sewers. All of these occurrences deposit pollutants into area streams and rivers, and the lake. Where’s your watershed? Watershed locations map: Five major watersheds of Northeast Ohio. Some people say rain, other say rainwater. We say stormwater, and it’s more than just rain. Stormwater is any rainwater or melting snow or ice that flows over the surface of the land to the nearest sewers, lake, or stream. Hard surfaces like driveways, roofs, parking lots, and even some lawns pose two stormwater problems: Pollution – like litter, debris, oils, etc. which the stormwater carries to its destination untreated – and increased flow when the water flows quickly and in larger volumes. That combination can increase flooding and erosion, the washing away of streambank soils. The Cuyahoga River is a symbol of efforts to clean up America’s waterways. Famous for catching fire, the Cuyahoga is now sparking excitement. Wildlife and people are returning. The proposed Cuyahoga River Water Trail will take advantage of new opportunities and be a lasting legacy.